A beautiful 26+ Acre horse property with an arena, horse stalls, a well fenced horse corral, includes access to BLM land and the US Forest. This place is an equestrian dream come true. 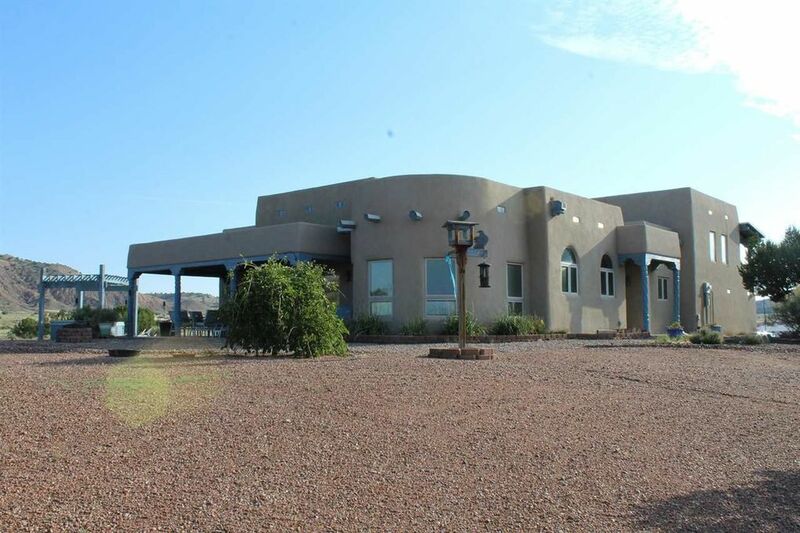 Located minutes away from Santa Fe, surrounded by incredible views, in a gated community, this 2525 Sq ft, two+ bedroom, three bath, home has so much to offer a family wanting to enjoy their life surrounded by beauty and living in beauty. The kitchen is spacious surrounded with much counter space, is everything a creative cook would want, with plenty of space for guests to sit around and participate in the culinary experience. The living room has two focal points, the beautiful fireplace and the natural, exquisite landscapes, Abiquiu has become famous for. The exterior patio doors make it easy to walk out and enjoy the alluring views. The master bedroom is relaxing, the fireplace, spa like bath, and patio access offers relaxation beyond belief. An incredible loft area with a private deck and private bath could be utilized as a studio, an extra bedroom, or a game room, only you can make that decision. Nearby is a one bedroom, self contained casita (532 sq ft) with a workshop and sables. All the buildings are made of adobe and have in-floor radiant heat, including the two car garage. The main house and casita both have tiled floors and in window blinds to control the natural light and passive heat. Large vigas tongue and wood compose the high ceilings in the kitchen, dining, living room, master suite, and porches. Sit out in the patio and enjoy the sunrise and the sunsets. Stroll around the house and enjoy the beautiful gardens. At night there is nothing better than soaking in the hot tub and watching the star filled sky. This home is secluded but not isolated. Come by, experience it, then buy it! Directions: From Santa Fe, Take Hwy 84/285 North through Espanola and stay on Hwy 84 towards Abiquiu. Turn Right on Hwy 554 towards El Rito, turn left on Blue Earth Trail, property is on the right.